With well over 1.7 billion monthly active users (users who have logged in to Facebook within the last 30 days), Facebook allows digital marketers to reach almost any market. The Facebook Ads Manager is user friendly and offers a multitude of targeting options, so you can get really specific when targeting your market, thereby making your ads more personal and effective. Because Facebook is easy to use and fairly inexpensive to buy traffic on, it’s a good place to start if you’re new to paid traffic or are testing a new strategy. Plus, you can apply many strategies used in Facebook on other advertising platforms. Ads on Facebook are like commercials on TV or the radio: You’re displaying your message in front of your audiences, but you’re also interrupting those audiences. 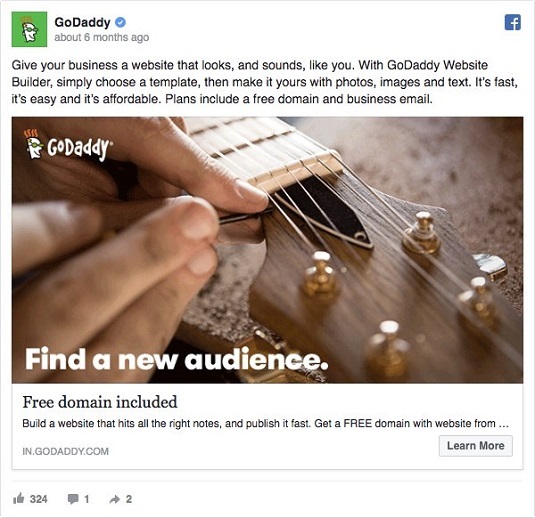 So you need to make sure to put your ads in front of the right people and to give your audiences a reason to click your ad, which is what the domain registrar and web hosting company GoDaddy does in the Facebook ad. GoDaddy gives a reason to click its Facebook ad. Facebook provides many objectives for marketers to select from. Choosing your objective is the most important part when setting up your campaign because it’s your way of telling Facebook exactly what you want your campaign to accomplish. Therefore, before you launch your campaign, know your end goal (such as to send people to your website, promote your company Facebook page, increase conversions on your website, get video views, or any of many more possibilities), and align that goal with your Facebook objective. To determine your objective, ask yourself: Who am I targeting and where do I want to send them? After you complete the first step of setting up your campaign (choosing your objective), you move on to setting up the audience you intend to reach. This step is essential. If you choose the wrong audience, your Facebook ad is likely to fail or, at the very least, not reach its full potential. Who are the figures, thought leaders, or big brands in your niche? Chances are, members of your audience follow these influencers on Facebook. What books, magazines, newspapers do your ideal customers read? What tools do they use? These tools can range from programs such as Photoshop or Evernote to physical tools such as fishing rods or lawn care equipment. What’s specifically unique about this audience? By knowing the answers to these questions, you can specifically target your audiences’ likes, behaviors, and locations on Facebook, making your ad more personal and more likely to be placed in front of an audience who is open to your message. Also, targeting specific likes and interests helps to narrow down your potential audience size, which is good because you don’t want it to be too broad; if it is, your ad can be less effective. If your business is local (as opposed to a national or international company) and you’re targeting a specific town, city, state, or region, you don’t have to worry about the size of your audience. Often, the audience size for local ads on Facebook doesn’t reach half a million to a million people; the town you’re targeting may not even have a population of that size. Local businesses don’t need to worry about audience size but instead should be concerned with how you’re targeting that audience. All other businesses that aren’t local should focus on how you’re targeting your audience and the size of your audience. The next step is to create your ad copy. When writing your ad’s copy, speak to your audience based on the pain point you’re targeting and where you are in the relationship. For instance, you don’t talk to someone you’ve just met the way you speak to someone you’ve known for ten years, and the same goes for your copy writing. Think of your ads in the context of where you are in the relationship with your lead or customer. Within the copy, hit upon a pain point your target audience deals with and then give people a solution (your offer, of course). If you have the room, add a sentence to eliminate doubt and overcome a reason the customer may have for choosing not to buy. Finally, consider what you want people to do after they’ve finished reading your ad. Include a strong call to action to help move them to the next level. Next, make sure that the image accompanying your copy portrays and backs up your marketing message. The image ties the ad together and makes the ad feel congruent. You don’t want an image that feels as though it came out of left field and has nothing to do with the copy or the offer. The image should stand out and be eye catching but not spammy-looking, so avoid too many arrows or obnoxious colors. Ultimately, you want the image to resonate with your market. If making images isn’t your strong suit, or you don’t have a graphic designer, consider using tools such as Canva or outsourcing your graphics with services such as Fiverr or Upwork to create professional images for your ads. 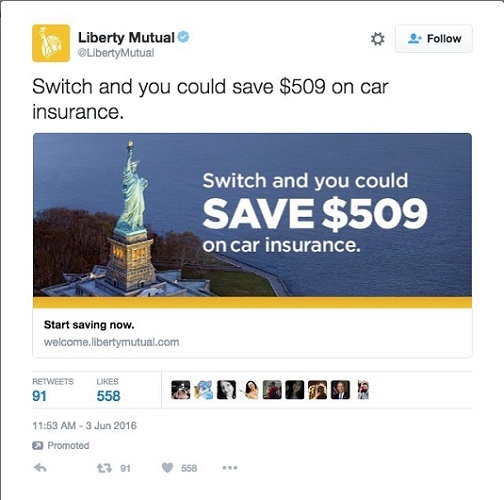 A promoted tweet from Liberty Mutual. For cold audiences in particular, you don’t want your Facebook ad to “scream” that it’s an ad; rather, you want the ad to be informative and provide value. Remember that you’re building credibility with your audiences. Ad copy that targets cold audiences is often longer than ads for warm or hot audiences. It also contains more information about the offer and what happens when people click the ad. In contrast, your language can be a little more informal and your copy shorter with warm and hot audiences.